A KVM (Keyboard, Video, Mouse) extender is a device used to extend a computer's console (keyboard, monitor, mouse) away from the computer. 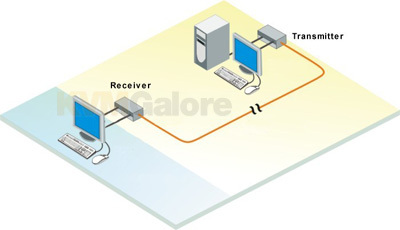 KVM extenderInstead of using long coax cables to connect the extended console to the keyboard, video and mouse ports of the computer – a KVM extender typically achieves the extension ...read more. Wirelessly Stream Your HD 1080p Content to Your HDTV with 3D Support!